You may remember that some months ago, SCHUNCK* Heerlen issued a challenge to high school students from seven European schools to design a sculpture inspired by “Hon – a Cathedral,” the legendary work Niki de Saint Phalle created for Stockholm’s Moderna Museet in 1966. 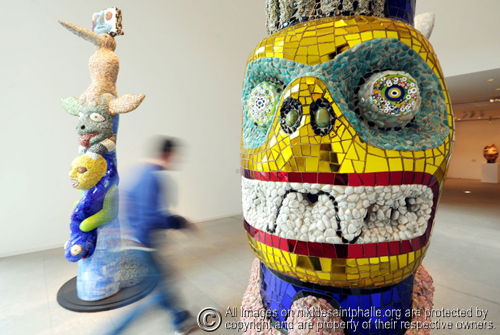 The context, of course, was the exhibition “Niki de Saint Phalle: Outside-In,” which opened at SCHUNCK* on 25 February. The winner, a polar bear named “Tosca,” was slated for full-size construction at the end of March. 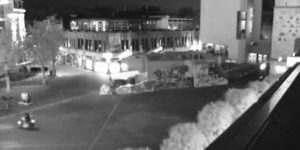 Well, Tosca is now living large in Heerlen’s Pancratius Square, as you can see for yourself via this live streaming webcam. (To give you an idea how large, the object on the lower left is a person on a scooter.) The official unveiling took place on 30 April. If you read Dutch, the Dagblad De Limburger / Limburgs Dagblad has details (“Reusachtige ‘ijsbeer-sculptuur’ Tosca geopend“). Congratulations once again to the students at the Institut Saint-Laurent in Liège who came up with this design! 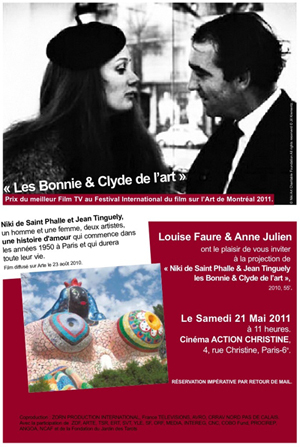 The story of Niki de Saint Phalle and Jean Tinguely weds a brilliant artistic collaboration with one of the greatest love stories in the history of art  a story detailed and celebrated in the award-winning film “Les Bonnie & Clyde de l’art,” by Louise Faure and Anne Julien. On 21 May, Faure and Julien will present a screening of their film at the Cinéma Action Christine in Paris. The 55-minute film will be shown on Saturday 21 May at 11 am at the Cinéma Action Christine, 4, rue Christine, Paris, in the 6th arrondissement between Odéon and the Place Saint-Michel (+33 01 43 25 85 78). “Les Bonnie & Clyde de l’art,” which was shown on the European cultural channel Arte last August, won the prize for Best TV Film at the Festival International du film sur l’Art de Montréal 2011. “The Kunsthalle Würth in Schwäbisch Hall shows the wide-ranging oeuvre of the multifaceted artist Niki de Saint Phalle, undoubtedly one of the most important artists of the 20th century, in a large survey exhibition. Through her paintings, assemblages, shooting paintings (tirs), sculptures and installations, this artist created a unique cosmos which established her international reputation.” Read the full story here. Curated by Guido Magnaguagno, former director of the Tinguely Museum in Basel, the exhibition presents more than 150 of Niki’s works. It includes sculptures from the Würth Collection and works on loan from the Niki Charitable Art Foundation, the Sprengel Museum in Hanover, the Musée d’art moderne in Nice, and other private and public lenders. It also includes films by the artist, key works by her partner Jean Tinguely, and paintings by her first teacher, Hugh Weiss. The exhibition runs from 17 April to 16 October 2011. The Wall Street Journal has some advice for its readers: Don’t miss “Niki de Saint Phalle: Creation of a New Mythology,” the new exhibition that opened 18 March at the Bechtler Museum of Modern Art in Charlotte, North Carolina. Under the heading “A Playful Sculptress,” the Journal includes the show in its “Don’t Miss” section for the week of 9-15 April. 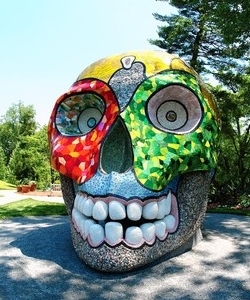 As the Journal notes, the exhibition includes some 60 works by Niki de Saint Phalle, in addition to five large-scale sculptures on outdoor display in the Green next to the museum.